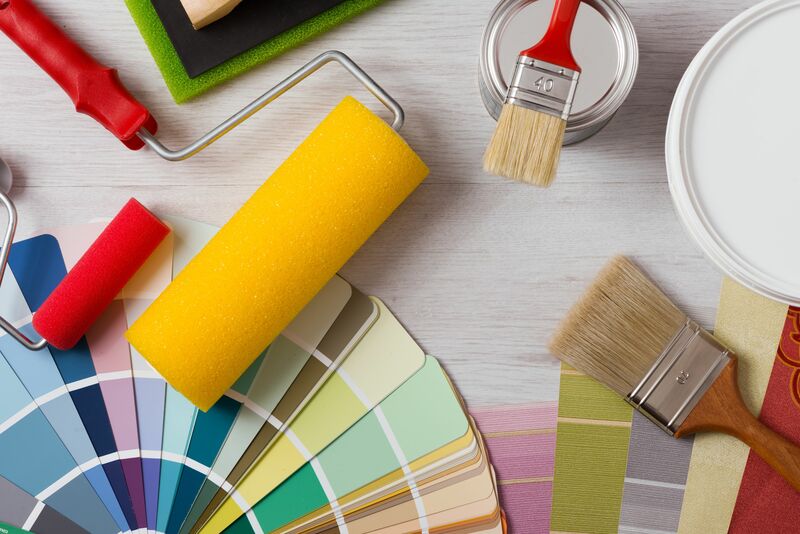 If you have undertaken a Do-It-Yourself home remodeling project, you will find that painting is perhaps one of the easiest things to do in it! Even if a paint job goes wrong, the maximum that is on stake is your pride! With such low risk involved, painting is the one aspect of home remodeling that you can do on your own and save cost. The only requisites of a good paint job are your time and patience, along with a lot of preparation. If you plan everything in advance that you will need: the tools, the colors, the type of surface-care required, as well as the time of the year when you want to set this project into motion, it will all be a "smooth sailing" for you! So the first step is to create a plan and a shopping-list to go with it! Painting doesn't just mean buying some brushes and paint and hitting the word "go!" As mentioned above there are a lot of preparatory steps involved before you actually get to pick up the brush! You need to first clean the existing surface of any grime, oil or smoke that will prevent the new coat of paint from sticking on. This means that you might need to add some cleaning solutions to your shopping list, along with a sponge-head floor-mop. Once the surface is clean and dry, you'll have to even it out and fill up all the holes and cracks, followed by a vigorous sanding - because the light reflections on a fresh coat of paint can easily catch and highlight any such blemishes on the surface. If it is not possible to smooth out all such blemishes, then you can use a flat paint (instead of the high-gloss kind) which will reduce any reflections. You will also need some masking tape to cover those areas which you don't want painted, like trims, glass edges and the edges where walls meet the ceiling or where two walls meet which have to be colored differently. Include some plastic sheets or masking paper as well, to cover those items of furniture in the room that cannot be moved. Once the surfaces have been prepared, you can start with the actual painting. Use synthetic bristles with latex paint and natural ones with oil-based paints. Applying a coat of primer first, followed by two coats of paint can give a long-lasting result and a good finish. Lastly, you need to ensure that you start this painting work when the temperature is between 55-90 degrees. If it's less than 55 degrees, the paint with not adhere to the surface; if it is more than 90 degrees, it won't apply smoothly.